As the very first Champagne House founded in 1729, Ruinart is held in the highest esteem in the hearts of champagne purists. This historic House owes its creation to its visionary and former monk Dom Thierry Ruinart, who understood the frenzy the nobility had for this sparkling wine that did not yet have the name champagne. Dom Ruinart wrote the founding act of the House that is still preserved until this day. Ruinart Champagne House is located in the heart of Reims and it watches over a treasure. Its chalk cellars are unique, historical monuments that are sheer architectural feats. They were classified as historical landmarks in 1931 and received UNESCO World Heritage status in July 2015. These cathedral-like cellars are located 40 metres underground and this is where the precious bottles of champagne wait in the cool darkness before they see the light of day. Ruinart’s signature and soul variety is the emblematic white grape, Chardonnay, which leaves its distrinctive imprint on each of the House’s cuvees. From the finest limestone soils of the Cote des Blancs and the Montagne de Reims, Chardonnay reveals its nobility, purity and aromatic freshness in emblematic vintages like the legendary Blanc de Blancs in its iconic bottle, or R de Ruinart, which is the quintessential expression of a Ruinart champagne. 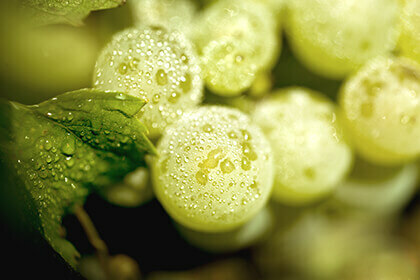 Elegance, style and timelessness define the core of Ruinart Champagne. It is one of the most appreciated brands in France that embodies the excellence of the French way of life in all four corners of the world. Owned today by luxury goods giant LVMH, Maison Ruinart stands out as the very first of Champagne’s great estates. Over the course of almost three centuries, Ruinart has led the way in the production of fine champagne, choosing to highlight the elegance and generosity of Chardonnay sourced from the region’s most celebrated terroirs. Their signature “blanc de blancs” and rosé cuvees are blended with great care, aged for years in the estate’s underground network of chalk tunnels and presented to the world through the perspective of celebrated artists. Considered the very first Champagne house, Maison Ruinart was founded in 1729 by Nicolas Ruinart. Inspired by his uncle Dom Thierry Ruinart, a Benedictine monk and visionary who predicted the enormous success of “wine with bubbles,” the founder was aided by the royal decree of 1728 in which Louis XV finally allowed the commercial transport of bottled wine in France. Nicolas launched his sparkling wine in the European market in 1730, and by 1735 it became so successful that he was forced to “quit his day-job” as a draper and focus solely on champagne production. With the expansion of production to meet the great demand, the business quickly outgrew its cellars. In 1768, Claude Ruinart decided to purchase 8 kilometers of crayères (Gallo-Roman chalk quarries) which had been excavated underneath Reims. The crayères of Ruinart (the first of any other Champagne house) are an impressive maze of chalk chambers dug down to 38 meters deep and still used to age the estate’s champagnes today. During World War I, these chalk tunnels served as the administrative offices of Andre Ruinart, the house’s 6th generation owner, when the buildings of the Champagne house were destroyed due to fighting. When Andre passed away in 1919, his wife Charlotte took over the management of the estate, joining Barbe-Nicole Clicquot Ponsardin (best known as the “Veuve Cliquot”) as one of Champagne’s very able wine widows. The crayères of Ruinart are still a popular attraction today and were declared a French historic monument in 1931. The chalk labyrinths of Champagne in general were further declared a UNESCO World Heritage Site in July 2015. Unfortunately, as was the case throughout the region, many of the most precious pre-war vintages were stolen by the Germans during their occupation of France through World War II. 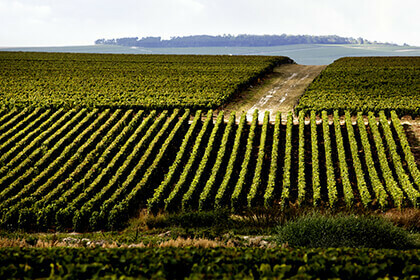 In 1963, the Ruinart estate was sold to LVMH. Just three years after the Dom Ruinart Rosé was created, a blend of 85% Chardonnay and 15% Pinot Noir. As a way to distinguish the brand from other prestigious labels in the LVMH portfolio, cellar master Jean-Francois Barot redefined the Ruinart style in 1990’s, choosing to adopt an idea first put in practice by Bertrand Mure, a member of the Ruinart family who became head winemaker in 1947: to focus on Champagne’s white varietal and produce Chardonnay-dominant cuvees. In fact, Chardonnay has been at the heart of the estate since the first vintage of its prestige cuvee Dom Ruinart, a blanc de blancs entirely made of Chardonnay, in 1959. In recent years, Ruinart has continued to set itself apart as a subtle and classy “boutique champagne” designed for discerning consumers who love Chardonnay. Out of the seven grape varieties authorized for champagne production, Ruinart has chosen the emblematic Chardonnay, for its freshness and elegance, to represent the backbone of all of their signature cuvees. The grapes are harvested from legendary terroirs, with grapes from Montage de Reims, Sezannais and Cote du Pertois balancing out the more austere Cotes des Blancs. The vines which yield the fruit blended into the cuvees of Ruinart are cultivated with the utmost attention and care paid to the environment. 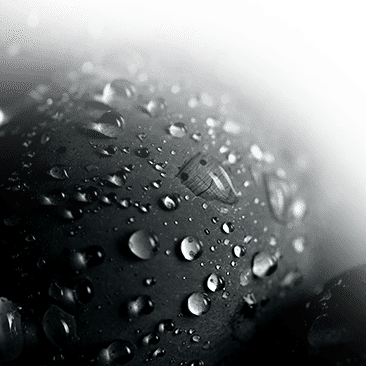 All of Ruinart’s wines are vinified in stainless steel with inert nitrogen gas used throughout the winemaking process to protect the fragile liquid from oxidation. An extended period of aging in the chalk crayeres results in autolytic layers, as the lees infuse each cuvee with a signature flavor of buttered brioche and add a creamy quality to the mouthfeel. Another signature of Maison Ruinart is the low dosage added to their cuvees, as a way to retain the freshness and natural flinty minerality therein. 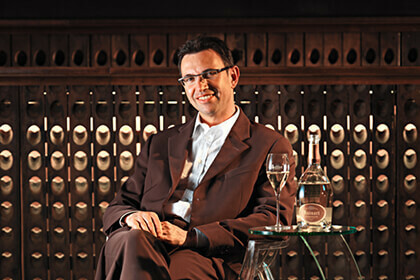 Led by Chef de Caves Frederic Panaiotis, the Ruinart winemaking team currently produces three main labels. The house signature Blanc des Blancs is a 100% Chardonnay blended from a variety of vintages, with 20-25% comprising base wines of the previous 2 years. The grapes are sourced from top terroirs in the Cote des Blanc and Montagne de Reims, whose fruit is known for their aromatic refinement. Fruit from Sezannais provide maturity to the final blend while grapes sourced from the north of the Vesle valley lend the final blend a certain lightness and touch of freshness. This wine, characterized by ripe citrus fruits; followed by white flowers, white peaches and pineapple on the nose, is a perfect option for aperitifs or to serve with fresh seafood dishes. The Ruinart rosé, the very first rosé champagne, is made from a blend of 45% Chardonnay from vineyards in Cote des Blancs and Montagne de Reims and 55% Pinot Noir from Montage de Reims and Vallee de la Marne vineyards. Around 18-19% of this Pinot Noir is made into a red wine, while the rest goes into the blend as blanc de noirs (white wine from red grapes). This pomegranate-pink rosé champagne offers notes of tropical fruit and small berries on the nose, followed by rose and pomegranate. Its delightful freshness and voluptuous body make it a great choice for heartier first course, like fine Italian prosciutto, Japanese salmon tataki or a festive holiday turkey with stuffing. In exclusively the best years, Ruinart also produces the Dom Ruinart Blanc de Blancs vintage champagne, made entirely of Chardonnay harvested from the Grand Cru vineyards of Cote des Blancs (Chouilly, Le Mesnil and Avize) and the northern slope of the Montagne de Reims (Sillery and Puisieulx). Although this prestigious cuvee differs from one vintage to the next, it consistently achieves a magnificent balance and generous texture that will stand up to creamier main courses and desserts as a particularly suitable pairing. The vintage champagnes of Ruinart will evolve nicely over a few additional years of cellar aging, gaining great intensity and complexity over time. 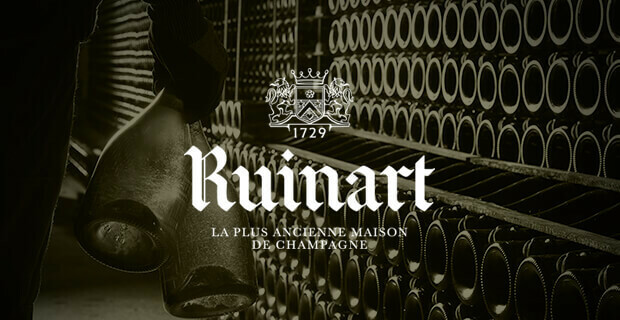 Ruinart’s legacy as a patron of the arts can be traced back to 1895, when Andre Ruinart commissioned the famous Czech illustrator Alphons Mucha to design Ruinart’s first poster advertisement, which was also one of the first advertisements in France. The estate continues this tradition by selecting a new artist each year to create original pieces for Maison Ruinart and incorporate their style into the packaging of a limited series of their Blanc de Blancs. Artist collaborators have included India Mahdavi in 2006, Christian Biecher in 2007, Maarten Baas in 2008, Nacho Carbonell in 2010, Gideon Rubin in 2011, Herve Van Der Straeten in 2012, Piet Hein Eek in 2013, Georgia Russell in 2014, Hubert le Gall in 2015 and Erwin Olaf in 2016. These works, each of which represents one artist’s understanding of some aspect of Ruinart’s brand identity, have been featured at art shows around the world. 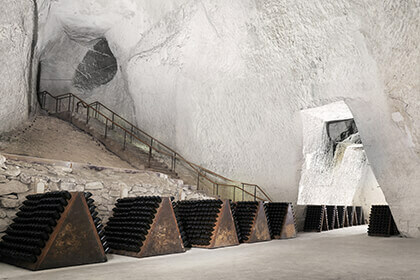 Most recently, the estate collaborated with Chinese artist Liu Bolin who created images of Ruinart staff camouflaging into their background throughout various steps of the winemaking process. This work is meant to emphasize the people behind Ruinart and their close connection to both technology and nature.